The bounce pass is a pass that bounces off the court once before it gets to your teammate; it is a very underrated pass in basketball. Many times there will be defenders getting their hands in the passing lanes, increasing a chance for a turnover. A regular horizontal pass is easy to deflect and pick off, but a bounce pass is much more difficult to catch. 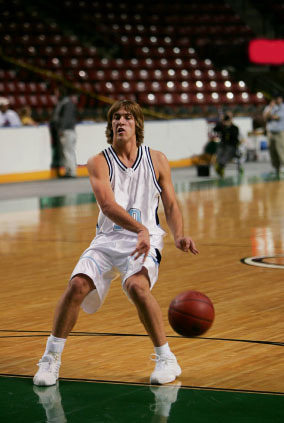 Hold the ball with both hands, similar to the way you hold a the ball when you're going to shoot. Now push the ball out with your dominant hand while using the other hand to guide it. Aim for an area halfway between you and your teammate for the ball to bounce (to create the right angle).